Indiana Gov. 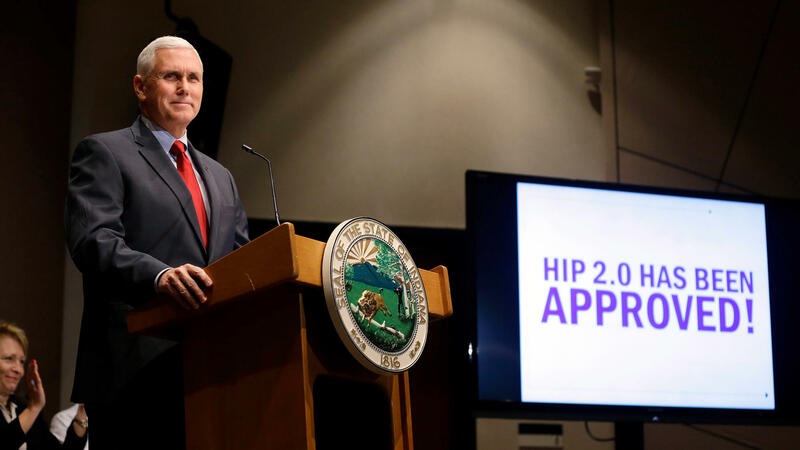 Mike Pence announces in 2015 that the federal Centers for Medicare and Medicaid Services approved the state's waiver request to expand Medicaid coverage. Seema Verma, President-elect Donald Trump's pick to run the Centers for Medicare and Medicaid Services, advised Indiana and other states on expanding their Medicaid programs. To get a glimpse of where Medicaid may be headed after Donald Trump moves into the White House, it may be wise to look to Indiana. That's where Seema Verma, Trump's pick to run the Centers for Medicare and Medicaid Services, comes from. And that's where she put her stamp on the state's health care program for the poor. Verma is a private consultant who was hired by Indiana Gov. and Vice President-elect Mike Pence to design a Republican-friendly expansion of Medicaid under the Affordable Care Act. The state paid her almost $5 million over four years through 2017, according to the contracts. She sees the federal Medicaid program as a bureaucratic nightmare that hamstrings states and encourages poor people to remain dependent. "The Medicaid program has not kept pace with the modern health-care market," she testified at a Congressional hearing in 2013. "Its rigid, complex rules designed to protect enrollees have also created an intractable program that does not foster efficiency, quality or personal responsibility." The plan she came up with for Indiana requires poor Medicaid recipients to make monthly payments for their insurance, or lose benefits. 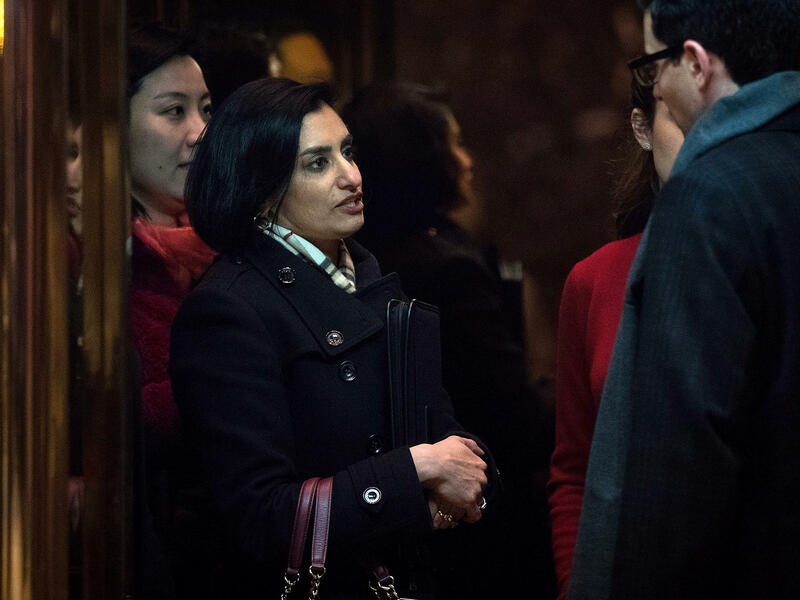 "Seema was very committed to extending coverage to low-income families in Indiana," says Cindy Mann, who was the CMS official who negotiated the deal with Verma on that state's Medicaid expansion. She says throughout the negotiations, Verma was "very committed to a particular ideology. That ideology is very much focused on personal responsibility." Verma did not respond to multiple requests to be interviewed for this story. Pence was one of the few Republican governors who took the Obama administration up on its offer to pay the lion's share of the costs for states that expanded their Medicaid programs to people whose incomes reach 138 percent of the poverty level, or $16,243. But rather than simply offer coverage to more people, the state sought a waiver to revamp its program. That's the deal that Verma worked out with Mann. Indiana's program, which extended Medicaid to about 246,000 people who weren't eligible before, is infused with Verma's ideas of how to make poor people take responsibility for their health care. It has a complex system of carrots and sticks. Beneficiaries make monthly payments from $1 to about $27 into individual health savings accounts, and the state also contributes. That money can be used for doctor visits and prescriptions. If beneficiaries get vaccines and other preventive care, they get a discount on their premiums the following year. But they can also be penalized. People whose incomes are above the poverty line can be cut off for six months if they miss a payment. Those below the poverty line are knocked down to a plan with fewer benefits. And if a patient unnecessarily goes to the emergency room, extra money comes out of the health savings account. "There are many ways to try and effectuate personal responsibility," Mann says. "Some states have moved forward with healthy behavior initiatives, for example. Some states have done some premiums and copays." Indiana's plan requires everyone to contribute to a health savings account. "And so the responsibility was really translated into payment requirements, and with pretty strong consequences if somebody was unable to pay." She says Verma and Indiana wanted the penalties to be even harsher — a full year with no coverage for people who miss payments. But CMS rejected that idea. So how does it work in practice? For Amber Thayer, a mom of three who lives in a Volunteers of America family shelter in Indianapolis, it's been a bit of a nightmare. Thayer is a recovering addict who has been clean for six months with the help of the medication Suboxone. And she's training to be a nursing assistant. "It's been quite, quite the struggle, but we've gotten there and we're doing great, and we're getting ready to get into our own home," she says. She pays $1 a month for her Medicaid insurance. In October, she got a bill for that $1 from a different company than the one she had been dealing with. She assumed the state had switched her. "It is only a dollar," she says. "I could pay a dollar a month, or I could pay $12 and that will cover me for the year. Unfortunately, at that time, I only had I believe it was like $2.38 on my card." So she called the company and used her bank card to pay the dollar. But the company, or perhaps the state, lost track of her dollar, and her insurance was cut off. She had her bank statement and a receipt from the insurer that proved she had paid. But she still spent six weeks, with multiple phone calls and visits to state health offices, trying to get her coverage restored. All the while, she scraped together enough money to buy Suboxone one dose at a time. "I'm fearing, you know, the withdraws," Thayer recalls. But she was also afraid the loss of insurance would interfere with her ability to take her nursing assistant exam, which in turn would threaten the stipend she gets because she is in job training. "If I don't get my stipend, we're not going to have our money to help us get into our home." It's these types of complications that have some advocates worried. Adam Mueller, a lawyer for Indiana Legal Services, says he's happy more of his clients have health insurance. But he says the state's notion that people will feel more invested in their care if they pay $1 a month just doesn't play out in the real world. "They don't feel like they have skin in the game," Mueller says. "One guy told me that it feels like Indiana is trying to take his last $12." Joe Thompson, CEO of the Arkansas Center for Health Improvement, says it's just hard to be poor. "The social stresses of low-income individuals probably make most aspects of managing through the day more difficult than if you have more affluence and have more resources available to deploy," he says. Thompson, who's a former Arkansas surgeon general, helped develop a Medicaid program in his state that had many of the same features as Indiana, including premium payments and health savings accounts. In the end, Arkansas decided it just wasn't worth it. "We had about a year and a half of experience there, and candidly the administrative cost and the operating aspects exceeded what the Legislature subsequently perceived the benefit of that program was," Thompson says. So the state scrapped the health savings accounts. He says the ideas about personal responsibility are politically popular, but implementing them is too complex. "We lose too many folks along the way, and we may be causing more challenges than we're solving," he says. Arkansas still charges nominal premiums for some Medicaid recipients, but they pay them directly to insurers. The carrots and sticks and individual accounts are gone. In Indiana, insurers also collect the premiums and administer the individual health savings accounts. James Gavin, a spokesman for the Family and Social Services Administration, says those costs are included in what the state pays the insurance companies, and so it's not clear exactly how much Indiana is spending to administer the health savings accounts. Verma has advised several states, including Iowa, Kentucky and Ohio, that are looking for Medicaid waivers from the federal government. Many of those waiver applications include cost features such as premiums or health savings accounts or incentives for healthy behavior. "The cost-sharing policy is not to burden the individual," she told lawmakers at the 2013 hearing. "I think it's to incentivize them and empower them to be part of the equation." When Verma testified in 2013, she urged lawmakers to make the process of getting Medicaid waivers easier. If she's confirmed as administrator of the Center for Medicare and Medicaid Services, it will be her and her staff who review waiver applications and determine whether they should go forward. OK, let's hear now how a Trump presidency could remake one federal program. Medicaid provides health insurance for the poor and disabled. To run the agency that oversees Medicaid and also Medicare, Donald Trump has nominated the architect of Medicaid in Indiana. As NPR's Alison Kodjak reports, the poor in Indiana have to pay for their Medicaid benefits or they face consequences. ALISON KODJAK, BYLINE: Seema Verma is a private consultant. She was hired by Indiana Governor and Vice President-elect Mike Pence to design a Republican-friendly expansion of Medicaid. Now she'll be in a position to determine whether other states can remake their health programs for the poor in the same mold. In congressional testimony in 2013, she said Medicaid is a mess. SEEMA VERMA: Its rigid, complex rules designed to protect enrollees have also created an intractable program that does not foster efficiency, quality or personal responsibility. KODJAK: Personal responsibility is a theme in a lot of Verma's work. She's advised several states - Ohio, Kentucky, Iowa and many others - on ways to revamp their health care systems for the poor. Many include cost-sharing features like premiums or health savings accounts or incentives for healthy behavior. VERMA: The cost-sharing policies is not to burden the individual. I think it's to incentivize them and to empower them to be a part of the equation. KODJAK: First off, it's important to note that Indiana's expansion under Obamacare did bring Medicaid coverage to about 246,000 people who weren't eligible before. It has a complex system of carrots and sticks. People make monthly payments into individual health savings accounts, and the state also contributes money. That money can be used for doctor visits and prescriptions, and beneficiaries get premium discounts if they get vaccines or other preventive care. But they can also be penalized. If their incomes are just above the poverty line, they can be cut off for months if they miss a payment. Those below poverty are knocked down to a plan with fewer benefits. Cindy Mann is an attorney with the law firm Manatt. CINDY MANN: There are many ways to try and effectuate personal responsibility. The Indiana philosophy was to set up a health savings account and to require everybody to contribute to the account. KODJAK: Mann was an official in the Obama administration who negotiated the deal with Indiana to expand Medicaid. MANN: And so the responsibility was really translated into payment requirements and - with pretty strong consequences if somebody wasn't able to pay. KODJAK: Mann says Indiana wanted the consequences to be even harsher - a full year with no coverage for people who missed payments. But the Obama administration said no. So how does Indiana's program work in practice? For Amber Thayer - a mom of three who lives in a homeless shelter in Indianapolis - it's been a bit of a nightmare. AMBER THAYER: Well, unfortunately, I am a recovering addict. KODJAK: She's been clean for six months with the help of the medication Suboxone, and she's training to be a nursing assistant. THAYER: It's been quite the struggle, but we've gotten there, and we're doing great, and we're getting ready to get into our own home. KODJAK: Thayer pays a dollar a month for her Medicaid insurance. But in October, someone lost track of her dollar - her insurance company or the state - and her coverage was cut off. She had a bank statement and a receipt that showed she paid, but she still spent six weeks trying to get her coverage back. All the while, she scraped together enough money to buy Suboxone one dose at a time so she could get through her nursing assistant exams. THAYER: I'm fearing, you know, the withdrawals, but I'm fearing, you know, I'm getting ready to go into clinicals, you know? If I miss a day of clinicals, I'm not going to get my stipend. If I don't get my stipend, we're not going to have our money to, you know, help us get into our home. KODJAK: It's these types of complications that have some advocates worried. Joe Thompson is CEO of the Arkansas Center for Health Improvement where he helped develop a Medicaid program with many of the same personal responsibility features as Indiana, including premium payments and health savings accounts. In the end, he says, it just wasn't worth it. JOE THOMPSON: We had about a year and a half of experience there, and, candidly, the administrative cost and the operating aspects exceeded what the legislature subsequently perceived the benefit of that program was, and so they stopped the health independence accounts, the health savings accounts. THOMPSON: When it comes to operationally having low-income Americans have to participate through that in addition to the complexities in our health care system, we lose too many folks along the way, and we may be causing more challenges than we're solving. KODJAK: But if Seema Verma is confirmed as administrator of the Center for Medicare and Medicaid Services, there could be many more states moving to Medicaid systems that put a stronger emphasis on personal responsibility. Alison Kodjak, NPR News. (SOUNDBITE OF JOSHUA REDMAN & THE BAD PLUS' "FRIEND OR FOE") Transcript provided by NPR, Copyright NPR.